Robert Ernest Halford (No.7 in the list of male British team members) was born in Tottenham, London in 1921. As a boy he would constantly be seen in the street on a pair of roller skates and on occasion would even skate to school. 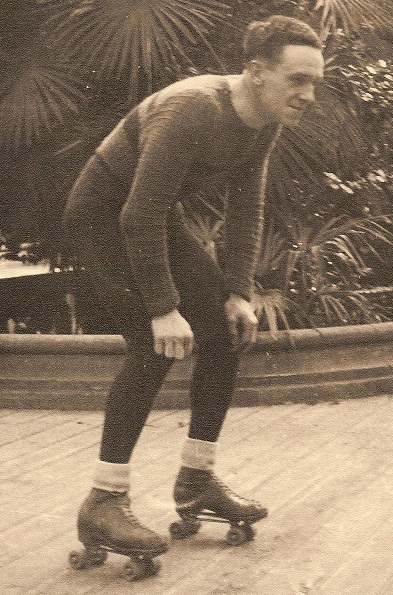 In 1938 he took part in his first ever race as an "unattached" skater - i.e. not a member of any particular club. A year later he joined the Alexandra Palace Roller Speed Club where he bacame one of "Jimmy Reed's Boys" and train and race at the old "Ally Pally" as it was affectionately known. But like so many of his skating friends at that time, his skating career was put on hold with the outbreak of the Second World War. Doing his bit for King and Country between 1941 and 1945 he saw service in Egypt, but even the war could not curb his enthusiasm for skating. He took his skates to Egypt where he and his friend, Frank Best, would regularly go and skate at a rink that they had found in Cairo! After the war Bob returned to racing and in 1946 was one quarter of the Alexandra Palace team that won that year's British Inter Club Relay Championship, a feat he would repeat in 1948 and 1949. Although an individual British title would elude him, he medalled no fewer than eight times between 1947 and 1951 in the British Championships, obtaining medals in all three distances. In 1948 it was anounced that there would be a recommencement of World Championships in Monfalcone, Italy, and trials for the British team were duly held around the streets of a capital city still licking it's wounds from German bombs. Bob was selected to represent his country alongside Stan Hartigan and Alf Martin, where he would achieve 7th in the 5000 metres. A year later he was again selected, and although Italy again, this time it was Ferrara where he would finish 9th in the 10000 metres. In 1951 Bob decided to retire from racing aged just 30, but although his competitive days were behind him he offered his services to the Roller Speed Committee where he would help administer the sport in Britain for the next 40 years as well as becoming a world renowned International Judge. In 1969 Bob was asked to manage the British team selected for the World Championships that were to be held in Mar del Plata, Argentina, later that year. Bob's first outing at the helm of the national team was nothing more than a resounding success. It was Britain's first ever major championship trip outside of Europe and collectively the team bought home two silver medals (Bill Sharman in the 5000 metres and John Folley in the 20000 metres) and a gold medal (John Folley in the 10000 metres). Not only that but Sharman and Folley would win the 2 man relay "Coupes Des Nations" (then the "unofficial" World Championship Relay) with a young Fry and McGeough taking second place. In 1971 Bob was again the team manager when Folley and Fry were crowned European Champions in Wetteren, Belgium. He would go on to see "his boys", as he called them, win gold again in Europe in 1979 when Fry, McGeough and Feetham all became European Champions in Ostende, Belgium. It could be said that in terms of British team management the 1970's belonged to Bob. He would often say that as team manager he didn't have to do much because "his boys" were all talented enough individuals in their own right. But he plays down his importance. It may be joked that he would take a kettle to the Championships and each morning wake "his boys" with a freshly brewed cup of tea in bed, but it was this attention to detail that left his team not wanting for anything so that all of their efforts could be used to concentrate on their racing. Bob was a London dock worker by trade and stood no nonsense, and more often than not he used this to full advantage to make sure "his boys" were well and truly looked after. Bob sadly died on 9th July 2015. Even just a few weeks before he passed away, aged 94, skating was still coursing through Bob's veins as he visited Tatem Park to watch his last event. He was often seen around tracks in Britain watching and supporting the sport that has given him so much enjoyment over his lifetime and even attended the occasional World and European Championships, his last being the World Championships in China in 2009 and the 2011 European Championships in Holland. Bob was probably one of the last of his generation in our sport that could put his hand on his heart and say that he had literally "done it all". A true legend.